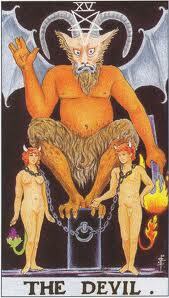 With the Sun in Scorpio (obsession) and the Moon in Taurus (lust), today and tomorrow are days of “The Devil”. Usually when you mention the Devil, you’re referring to temptation – temptation that will get you into serious trouble unless you’ve the strength to resist. This in turn generates apprehension and fear as well as – go ahead – admit it – just a touch of curiosity? The Devil might have made him ‘do it’ – but ‘it’ could never happen to you – right? It’s not that easy and you know it so why are you so hesitant to agree or disagree? Because in Christian communities, the Devil is considered as the summum malum – the sum of all evil – and as the result, its energy is believed to be as dangerous as it is unfathomably complex. I’m no more certain what that really means than you are. But I do know that today and tomorrow we’re each dealing with ‘it’ – our personal unconscious – at the height of ‘its’ power (the full moon is exact at 15:17 GMT on 17 November at 25 Taurus 26) and that scares the hell out of us for reasons we’d each prefer to ignore. We all know from Carl Jung that in our unconscious lies buried treasure of tremendous value just waiting for release – but as all myths and fairytales tell us treasures like this must be guarded by monsters and dragons – dangerous adversaries who will stop at nothing to prevent us from recovering the coveted prize. In reality, these monsters and dragons are nothing more than our own fears – the actions, motives, wishes, intentions thoughts, and qualities that we find most embarrassing – that which we dread we might someday be forced to face. Yet on a day of “The Devil” that is precisely what you can expect. The most unloved sides of your personality can be expected to surface – lust for power, money, drink, what have you – causing such havoc in the outer world that you too might be tempted to retort – “the devil made me do it”. And in some respects, you’d be right. But the trick to dealing with the energy of today and tomorrow in the most constructive way is not to blame the devil or anyone else – but to be humbled and accept these limitations and embarrassments as none other than your own.